Hi Tiffany. Many thanks for visiting my blog during your world tour. It's great to have you here and I hope you'll answer a few questions. Thank you, Robyn. It’s an honour. 1. Now, I'm curious about you, Tiffany, and how you got to be here today. Can you tell us a bit about yourself and your journey which led you to being a guest on my blog. Oooh, that’s a difficult one, Robyn, because my earlier life is veiled in mystery. (That’s partly because I drank a little too much forget-me-not tea and the effect reversed.) I started writing stories about the Little Horrors I meet at the Hags’ Abademy soon after I adopted Speedwell, my Hairless Sphinx. Speedwell likes his food, and I had to have some way of supporting us. I was persuaded that writing tell-all exposes of the Little Horrors would make my fortune. Along the way, I met Sally Murphy of Aussie Reviews. She offered me a chance at a world tour, so here I am. 2. Little Horrors is a new series with Little Hare. Can you tell me how many books you have written? And, if you're not revealing any secrets, a few details about the books? So far, I have written four books. The first one is about Flax, a feral fairy who ran into trouble when she attended Miss Kisses’ Academy of Sweetness. There she met Kirsty Breeks, a Scottish water hag. Kirsty helped arrange a better future for Flax. The second one is about Mal the Mischievous mermaid. I learned a lot about merfolk while writing this one. Did you know they can walk on their tail flukes? They call this “tip-tailing”. Then came Nanda the Naughty Gnome. Nanda told a fib to Hag Maggie Nabbie, and that earned her an invitation to try for a Badge of Badness. Nanda said she didn’t want one of those… can you believe it? And the fourth book is about Tikki, a pixie from Pisky Marsh. She got up to some tricks, I can tell you. Lock up your golf balls when Tikki’s around. 3. What is it like working with Little Hare? Are they Little Horrors? Can you give us an insight into this experience? The Little Hare people are so sweet I’d suspect them of being good fairies if it wasn’t for the gleam in their eyes. They are, however, very eager to get every word exactly right. Each story has to glitter like the quartz Nanda’s Grandpa Clog polishes for the good fairies. Mind you, the tatts in the books aren’t the kinds of things a good fairy would countenance. 4. Who is your favourite character in Little Horrors? And why? I love the Little Horrors (I have to say that, otherwise Flax would set the dog-fae on me). Actually, I love the critter-fae too. And the hags. If I have to have a favourite, it’s probably the dog-fae. It’s an imp with canine DNA. It looks like a fluffy brown and white dog with fuzzy little wings, and its crankiness makes it a perfect foil for Flax the feral fairy. What’s not to love? 5. I'm interested in how other writers work and create their books. Can we have a peek into the writing life of Tiffany Mandrake? Every morning, I dress in flowing velvet, brew some herb tea and go to sit in the grounds of my creepy cosy cottage. At some point, one of the critter-fae will come to visit. They say they like my company, but I believe the snacks I provide have something to do with their visits. I pay attention to detail, and I have arranged perfect little habitats for each one when it comes. The dog-fae has a neat little crocheted kennel stuffed with liver treats. For the fox-fae, I made a cosy den lined with black velvet and honey-coated bugs. The gull-fae has a rock with a pool by it, and plenty of chips to eat, and the filly-fae has a green stable with peppermints in the manger. Anyway, when the critter-fae come to visit, I make them feel at home and ask them a few general questions. They tell me all about their fairy breed friends. I take notes. Every afternoon, I retire to my cottage to write up my notes, then have a nap with Speedwell before rising with the moon to dance to the Hags’ bagpipes and gather dodgy herbs. It’s a hard life, but someone’s got to live it. 6. What advice would you give a writer who'd love to be in your shoes and have a book or series published? Stay out of my shoes. I have somewhat unusual feet, and no one else would fit my footwear. As to books and series, all I can suggest is that they should move to a weird place and wait for weirdness to happen. On the other hand, they could take the difficult route and come up with a killer idea, write a killer proposal, hypnotise the editors and… well, forget I said that. Oh, some people don’t know how to write a proposal? If they go to www.affordablemanuscriptassessments.com and click on Workshops, they may learn something to their advantage. Thanks for including my blog in your first world tour, Tiffany. May this tour be the first of many. I look forward to having you visit again one day. And thanks for answering my questions. I'm pleased to be involved in the blog tour of the Little Horrors series by Tiffany Mandrake. Here is a little information about the series, supplied by the fabulous Tiffany Mandrake. Three Scottish water hags, displaced by the draining of lochs and general failure of the fairy breed/human relationship, are on the point of giving up. There are no young bad fairies coming on, and all the GOOD fairies are doing sweet deeds without regards to the consequences. One hag, Kirsty, discovers a single young bad fairy at Miss Kisses' Academy of Sweetness. This discovery leads her to band together with Maggie Nabbie and Auld Anni to create their own school - the Abademy of Badness. The hags are bad fairies, but they are not evil. Their sense of justice means they will never try to change a good fairy into a bad one. Therefore, they devise a test for their candidates. Each likely little horror must create and submit an original act of badness to qualify for the Badge of Badness and enter the Abademy. The hags stay out of this, but they do provide a fetch (imp, familiar) for each candidate. These critter-fae are imps with animal DNA. They are sharp witted, smart and bad to the bone. Each story introduces a new main character, and charts her journey as a candidate. Flax is a feral fairy. Her act of badness is to kidnap a young film star and bamboozle two crooks... but that isn't how she wins her badge. Mal de Mer the mermaid has her eyes set on ruining a marine theme park. Tikki Flicker the pixie bewilders a group of Pixiepackers and their Leader, while Nanda Gemdibbler the gnome (who really believes she is a GOOD fairy) leads a young human comprehensively up the garden path of wish fulfillment. The stories are all self contained, but the three hags appear in each one. Occasionally, other characters appear in more than one book. Each tale is ostensibly told by Tiffany Mandrake, a human who lives in a cottage in the Abademy grounds. Tiff has a whole biography, but this is never mentioned in the stories. She plays no active part, but implies that the critter-fae act as her informants. Flax the Feral Fairy and Mal the Mischievous Mermaid are published by Little Hare. Today, we have a special guest, Sally Murphy. Sally is on a blog tour to promote her latest book, The Big Blowie. Thank you, Sally, for including us in your blog tour. We're glad to have you here. Thanks Robyn. I’m delighted to be here. 1. First things first, Sally. Can you please tell us about Sally Murphy? Who is she? And how did she become an author of children's books? Moi? I’m a mother, teacher, reviewer of books and, of course, children’s book author. My two passions in life are children and books, so it was a natural progression for me to become a children’s book author. But, more than that, writing for children is what I always wanted to do with my life from when I was a child myself. When I left school, I did other things before I achieved my dream of being a published author – most notably having my six children, getting married and becoming a teacher, but I never lost sight of the dream and always knew that I would one day be able to devote myself to writing full time. Now that dream is close to a reality, though I still teach part time and, of course, am still a fairly busy mother. 2. The Big Blowie is a wonderful, catchy title. Can you please tell us more about the book? I'm intrigued and I'm sure others are too. Every afternoon, tourists visit beautiful Lake Blowie. They have afternoon tea at Syd’s place and buy postcards and souvenirs. But the drought has made the lake dry up. A new attraction is needed – and Syd knows just the thing! The above is the blurb from the back of the book, but as I'm here promoting the book I’ll tell you a bit more. Syd’s family farm is reliant on income from tourists, who arrive each day with tour guide Dougie. But when Dougie has to stop coming because of the drought draining the lake, Syd decided they need a ‘big thing’ to bring the tourists back – and so The Big Blowie is born. It is made out of farm junk – an old windmill stand holds it up, a car body is the fly’s body, with corrugated iron for wings, old wheels for eyes and so on. But Syd still needs to convince the tourists to come back so needs to convince Dougie to come and see the Big Blowie. 3. I know people are always interested in where writers get their ideas. Can you please give us some background on how you came up with the idea for The Big Blowie and what you did to develop this idea into a story? The idea came from my brainstorming as many Australian things as I could that I thought would fit into this series. The series guide requested Australian subject matter and Australian issues, so I came up with a ‘Big Thing’ being built in the Outback to draw tourists in during the drought. Australians love ‘Big Things’, and what could be more Australian than a big blowfly – they are everywhere! 4. I'm curious about how other writers work. Can you please give us a little information on how you work as a writer? Mostly, my work style is a bit chaotic. I always have several stories at different stages of incubation. Some are just ideas in my head, rolling around waiting for me to tease them out a little further. Others I have roughly planned and am working on writing a first draft (I do try to only do this to one story at a time, but it doesn’t always work that way). Still other stories have been written down as a first or subsequent draft but are waiting for me to come back and edit further before I send them out. Then of course, there is usually one that I’m working on editing right now. And others still have been put into the too hard basket for now, waiting for me to work out just what needs doing next. Lastly, there are the stories which are complete but unplaced, and the cherished few which are finished, accepted and in various stages of the editing process. For example, at the moment I am working on the first draft of a verse novel, am at the planning stage with a nonfiction book, have several picture books which have been drafted and are waiting for rewrite, a pile of poems in the same stage, and a new story idea ticking around in my head for which I have done a little research. I also have four accepted trade titles in production which are at various stages of editing. So, from time to time I need to drop everything else to work on these. When I have a new idea, I usually let it roll around my head for a little while, so that by the time I start writing I have a sound idea of where the story is going, though I rarely write a plan. For picture books I write the first draft in a single sitting, but for longer stories it of course takes longer but i try to work on it every day until that draft is done. Then, when it’s finished I put the draft aside for a while (days, weeks, sometimes months) before I start editing, so that I come back to it with a fresh eye. Editing is the hard part because when you bond with what you’ve written it’s hard to see its deficiencies. That’s why I belong to a critique group, and get my crit partners to critique anything I’m not sure about. . When I’m happy with a story (usually after many drafts), I send it off to a publisher. If it is rejected more than a couple of times, I usually take another look and see if the distance of time hallows me to see anything new. 5. I know you have another book coming out soon. Can you tell us about any upcoming releases? Or what's next for Sally Murphy? Oh yes. I am very excited about my next book. It is called Pearl Verses the World, and will be released by Walker Books Australia in May. This is my first verse novel, aimed at younger readers and beautifully illustrated by Heather Potter. In November I also have a picture book, Snowy, being released by Random House Australia and illustrated by David Murphy (yes, he is related, being my brother in law). I also have a picture book being released by Koala Books, called Constantine and Aristotle, and being illustrated by Ben Wood. Unfortunately, I don’t yet have a release date for this one. And in 2010 I have another picture book with New Frontier. So there’s lots of new things coming and lots of excitement at my end. What’s next is to enjoy each new release (and promote them, of course) and to write more stories. 6. What advice would you give to writers who want to write a children's book and get it published? Read as many children’s books as you can – new release books, mostly – and write as often as you can. Don’t write one story then try to get it published. You must keep writing and revising and learning. Chances are, the first story you write won’t get published, but if it does, then you’ll want to be already working on the next one. As well as writing and reading you need to study the market. You need to know who is publishing the kind of book you are writing, and you need to get a feel for what sorts of books appeal to kids. Visit bookstores, publishers’ websites, review sites, writers’ blogs, message forums. Spend lots of time immersing yourself in the world of publishing. Importantly, if you are easily discouraged, writing is the wrong career for you. You need to be persistent, resilient, determined. The hard knocks can be very hard – but they make it all the more wonderful when you finally hold a published book in your hands. Thanks for sharing with us, Sally. We wish you great success with The Big Blowie and your blog tour. Thanks for having me, Robyn. Welcome to Writing Children's Books with Robyn Opie. Sally Murphy will be answering questions about her latest book, The Big Blowie, as well as questions about how she became a writer, where she gets her ideas, how she works as a writer and her advice for anyone who wants to write a children's book and get it published. The blog tour is only days away. We hope to see you soon. 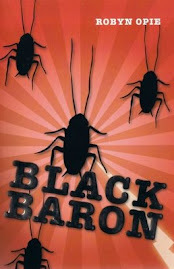 Will Jake and Black Baron escape the exterminator? All Rights Reserved, Robyn Opie Parnell. Picture Window theme. Theme images by Deejpilot. Powered by Blogger.